Yesterday was our first work day out in the Demo Garden. It was beautiful yesterday, and we had lots to accomplish. I’ll be posting about several of the different things we did throughout the week. One of our priorities was getting the Family of 4 garden started for the spring. We started out by cleaning up all the weeds and working in the straw remnants from last year. 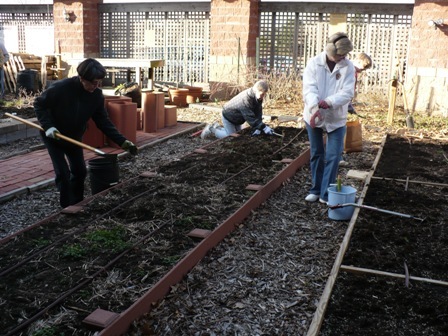 Then we worked in compost, followed by a very low rate of fertilizer. Our soil test last year indicated that we didn’t need phosphorus and potassium – just nitrogen. The compost and organic matter will probably provide the necessary nitrogen later on, but right now the soil is so cold that some extra nitrogen and phosphorus is going to help our little seedlings. 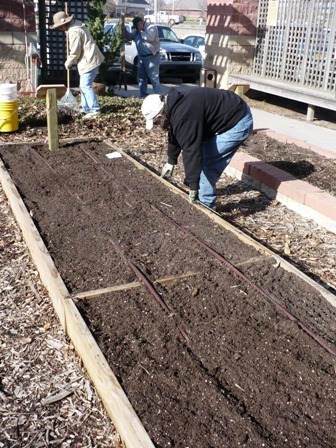 We planted Cherriete and Easter Egg Radishes, Tyee Spinach, and Wildfire Lettuce Mix on the south end of the garden. 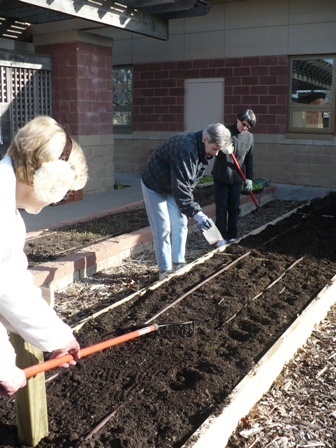 We also planted some more radishes and transplanted some leftover lettuce from the garden show into the area where we will have tomatoes in May. No reason to leave that space empty! Posted on March 24, 2010, in Family of 4 Garden, Working in the Garden and tagged garden cleanup, Garden plan, gardening, planting seeds, raised beds, salad greens, vegetable gardening, vegetables. Bookmark the permalink. Leave a comment.